David Cameron risks causing "alienation" in society by saying Britain is a "Christian country", a group of public figures has warned. Author Sir Terry Pratchett was among 50 signatories of a letter to the Daily Telegraph saying Britain was a largely "non-religious society". The PM said the UK should be "more confident" about its Christianity, a view No 10 says he has stated before. 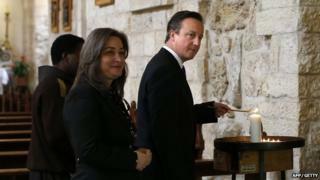 Faith leaders have said they are "very comfortable" with Mr Cameron's views. The open letter's signatories included author Philip Pullman, performer Tim Minchin, journalist Polly Toynbee, philosopher AC Grayling and presenter Dan Snow. Its lead signatory was Professor Jim Al-Khalili, president of the British Humanist Association. The group said it respected the prime minister's right to his own religious beliefs, but said: "We object to his characterisation of Britain as a 'Christian country' and the negative consequences for politics and society that this engenders." "Apart from in the narrow constitutional sense that we continue to have an established Church, Britain is not a 'Christian country'. "Constantly to claim otherwise fosters alienation and division in our society," the letter said. Human rights campaigner Peter Tatchell told BBC Radio 4's Today programme the assertion Britain is a Christian country was "not factually accurate". He said a YouGov poll found 65% of people questioned described themselves as "not religious", while 29% said they were. He said those people would have come from a range of faiths - not just Christianity. Mr Tatchell said the evidence shows the is not a Christian country, saying: "We are a multi-faith society, we are also a no-faith society." His claims come after figures released by the ONS following the 2011 census found that, despite a drop of four million in the number of people who said they were Christians in England and Wales from 2001, 59% of residents still described themselves as Christian. Christina Rees, a member of the General Synod, the highest governing body of the Church of England, said she was glad Mr Cameron had the "confidence" to talk about his faith and was "absolutely right" to call the UK a "Christian nation". She said the UK was "historically and culturally" Christian. Farooq Murad, secretary general of the Muslim Council of Britain, said nobody could deny that the UK remains a largely Christian country with "deep historical and structural links" to Christianity. He said "a sense of the sacred is to be cherished" but added that the UK would be stronger by "recognising and celebrating" people of multiple faiths and of no faith "living in harmony". Anil Bhanot, managing director of the Hindu Council UK, said he was "very comfortable" with the UK being described as a Christian country. In an article for the Church Times earlier this month Mr Cameron said Christians should be "confident" in standing up to defend their values. The prime minister also spoke of his faith in his Easter message, saying he found "peace" in Christianity. Downing Street spokeswoman referred to a speech made three years ago by the prime minister where he said the UK was a Christian country and should not be afraid to say so. "He has said on many occasions that he is incredibly proud that Britain is home to many different faith communities, who do so much to make the UK a stronger country." BBC political correspondent Chris Mason said Mr Cameron's comments could be politically "useful", coming as the UK Independence Party (UKIP) has been "emphasising traditional values".